New York's all-time leading scorer enters his senior season with over 3,300 career points on the hardwood after winning second state title on the gridiron. The four-star basketball standout led Glenn Falls to its second state title in three years on Saturday. Joe Girard made a national splash last basketball season, averaging better than 50 points per game while breaking the New York career scoring mark set by current Los Angeles Lakers sixth-man Lance Stephenson. On Saturday, he finished off a pretty remarkable football career. The Syracuse basketball commit led Glens Falls (N.Y.) to a 55-32 victory over Batavia and captured his second football state championship in the last three seasons. A senior quarterback, Girard threw for 314 yards and two touchdowns, rushed for two scores and added an interception on defense. He did it at the Carrier Dome on the campus of his future college Syracuse. Girard finished with 3,078 passing yards and 36 TDs this season. The three-star recruit finished with 6,767 yards, and 83 TDs in his illustrious career. He also recorded more than 1,500 career rushing yards and 31 scores. The do-it-all athlete started at safety and punt returner all four years. New York's all-time leading basketball scorer enters his senior season with over 3,300 career points.The 6-foot-2 shooting guard is one of the most accomplished dual-sport athletes in America. Asked on Oct. 14 if he'd consider playing football over basketball, Girard said: "Right now, no. I'm going to be a Syracuse basketball player. Right now, that's what I'm focused on." 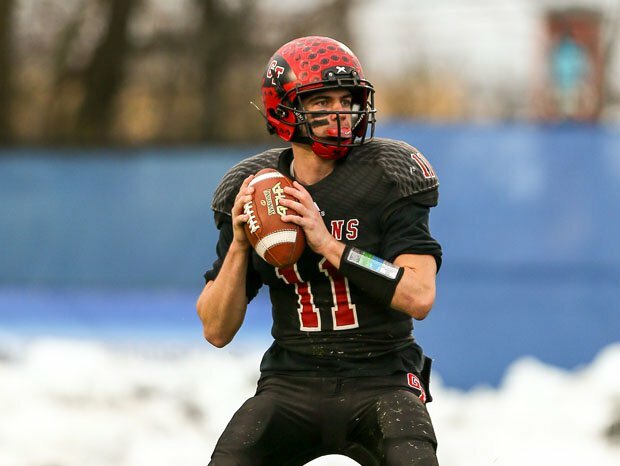 Glens Falls quarterback Joe Girard won the team's second state title in three years.